As we continue on the Food Journey of Summer Vacation 2012, I do hope that you are all enjoying the ride. Since I am a total Foodie and Obsessive Planner, I had all of our meals planned months before we even set food in Chicago. After numerous recommendations from Chowhound and Blogs alike, I knew we would be visiting a BBQ Joint while we were in town. I had two in mind but narrowed it down to BBQ Smoque and decided we would try this. After the afternoon game at Wrigley, we drove to see Obama’s old Chicago House. After that, we were all quite hungry (we were still on Eastern Time stuck in Central Time) and we headed to the restaurant. 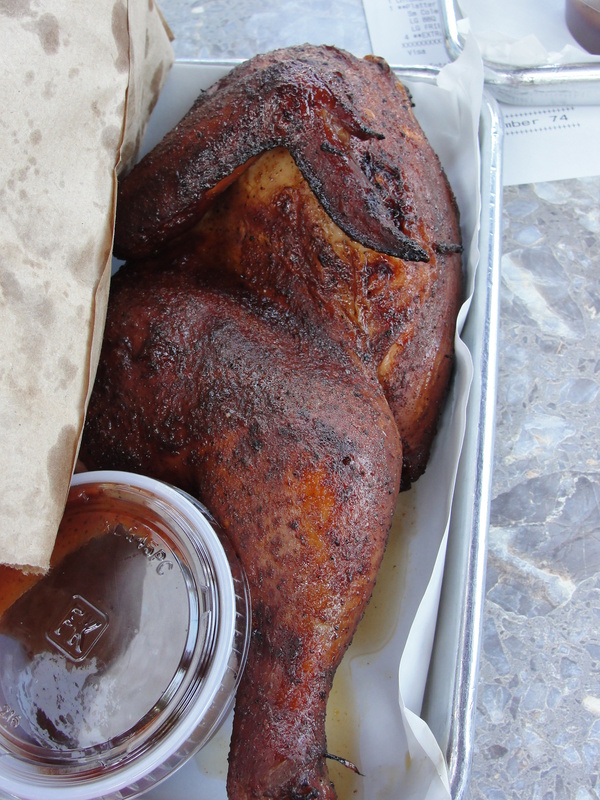 Located in a simple suburban area, we pulled up to Smoque. The first thing we saw was that Smoque was packed. We got one of the last parking spots and the line was out the door. While there were some tables available outside (it was warm…these people don’t do heat like us Floridians), the inside was packed. After waiting in line for 30 minutes, we arrived at the counter to order. The system at Smoque involves waiting in line, going to the counter, placing your order and being sat by a host. Once you are sat, your host brings out your food when it is ready. Since we had 30 minutes to choose our offerings, we were ready to go at the counter. I do not eat pork or much beef so, I usually go with chicken when it comes to BBQ. Mommy and Taylor ordered the brisket while I opted for the BBQ Chicken. 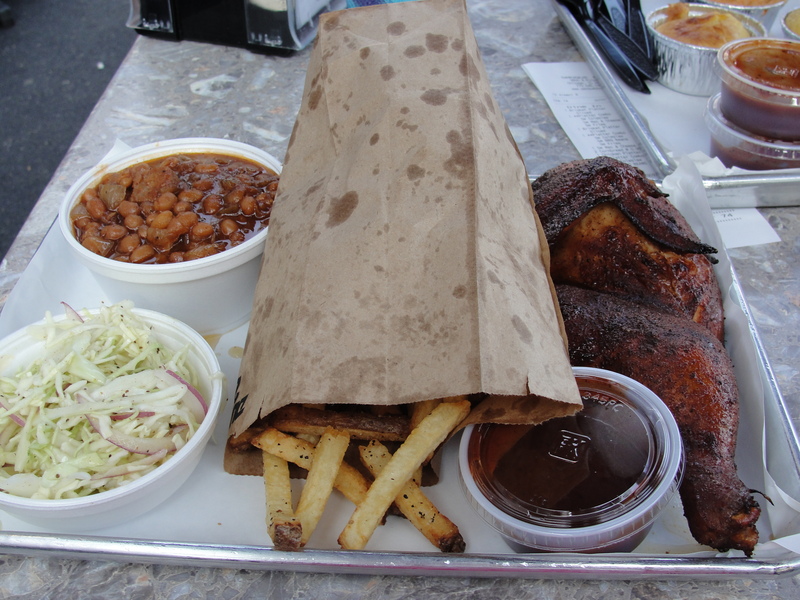 I selected Fresh Cut Fries, Baked Beans and Cornbread as my side. We made our way to our outdoor table and anxiously awaited the arrival of our food. After 10 minutes or so, our food arrived. We each had our own tray and all 3 were loaded with food. The first thing I noticed were the insanely huge portions. The total for the 3 of us, with drinks, was $40. This is C H E A P when it comes to bbq and for portions this size? Smoque was already scoring big in my book. I also requested some additional bbq sauce when I ordered which we had in small containers. While giving my food a few moments to cool, I decided to open and try the sauces. I did not really love either sauce. I found the flavors to be okay in both of them…just okay. One sauce was a little bit sweet while the other had a faint flavor of tangy. What I did not like about either sauce was the amount of dry ingredients in them. They almost tasted like dry rubs with a bit of liquid rather than a liquid bbq sauce. On their own these were not good, but, combined with the sides, they were much better. Let’s begin with the sides. 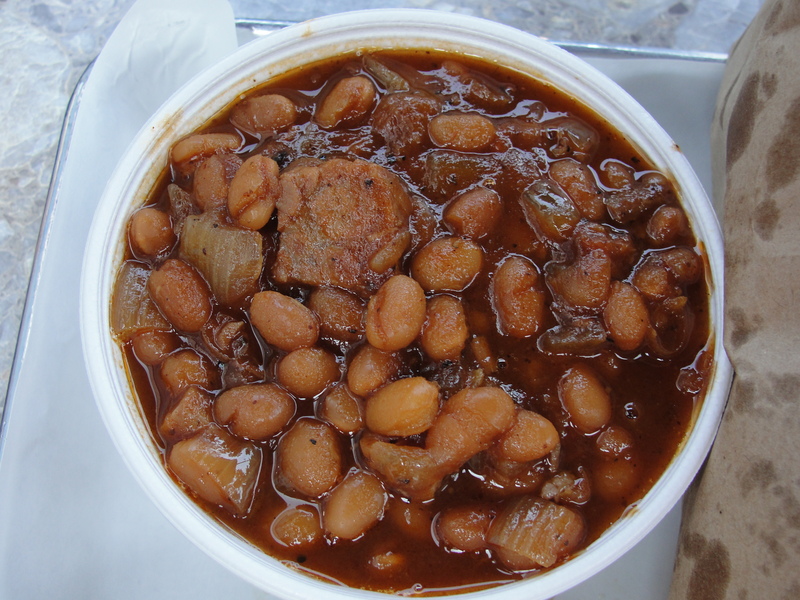 Baked Beans are usually my favorite side at any bbq joint. I absolutely can’t get enough of them. I am really sad to say that I can’t say the same for Smoque. These beans were loaded with different pieces of bbq meat – a no no for me. Besides the meat pieces, I found the beans themselves to be lacking in flavor. I didn’t taste any smokiness or sweetness in them at all. The primary flavor I could taste was brisket. I tried to poke the meat pieces out and just eat the beans but, the overall taste just wasn’t up my alley. It’s not that the beans were bad, it’s just that they weren’t for me. As for the Fresh Cut Fries, they were awesome. While in line I could see the worker behind the counter making the fries from fresh potatoes. There is simply nothing like a Fresh Cut Fry. Each and every fry was perfectly cooked. The result was a slightly crispy exterior with a beyond soft interior – a feat that can only be accomplished when making Fresh Cut Fries. Every fry was lightly seasoned with salt & pepper which enhanced the potato and overall flavor of the fry. I ate nearly all of my fries and let me tell you, I had a ton of them. I also enjoyed the fries mixed with the bbq sauce. By mixing the fries into the sauce, I lost the extra-dry consistency of the sauce and gave the fries a little something extra. By far one of the top 5 Fresh Cut Fries I have ever had. The cornbread was also exceptional. The piece was served in a small aluminum muffin form and was extra soft. 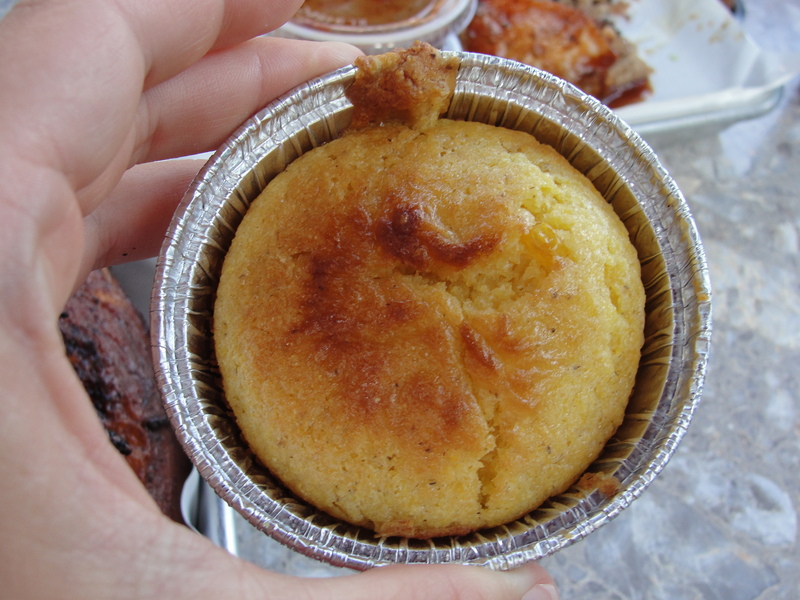 My beef with cornbread is always that it is too dry but Smoque really nailed this. Plus, the cornbread paired perfectly with the bbq sauce. As for my piece of chicken, let’s just say it was a huge piece. I was under the impression that the chicken would be the usual pink color from the smoking but, the chicken was more white than pink. This was okay with me but I certainly felt as if the chicken was missing the natural smokiness. I remove the skin from the chicken prior to eating it so, I rely heavily on the chicken carrying the flavor. This chicken was still good and very moist. I didn’t really love how it went with the bbq sauce but dipped pieces here and there into it. The portion was huge and even with sharing some, I had a few bites left over. While this was no All-Out-B-B-Que chicken, it was still pretty good. As we finished our meal at Smoque, we were all full and completely satisfied with the meal. Both Taylor and Mommy absolutely loved the brisket along with the sides. Finishing our meal, we all kept commenting on how huge the portions were. The service at Smoque was also great and our empty plates were quickly cleared. While I won’t say this is the best bbq I have ever had, Smoque was still quite good. 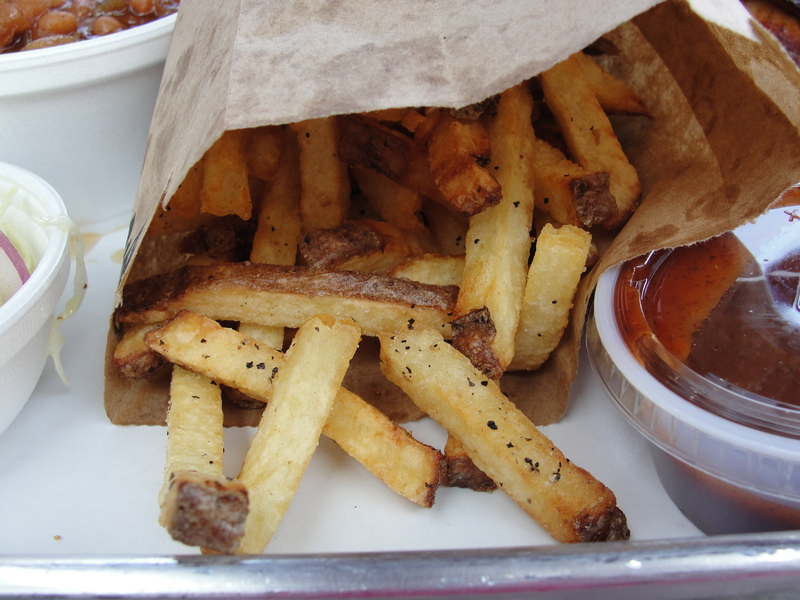 And give me some Fresh Cut Fries, and that basically assures you a place in my heart. 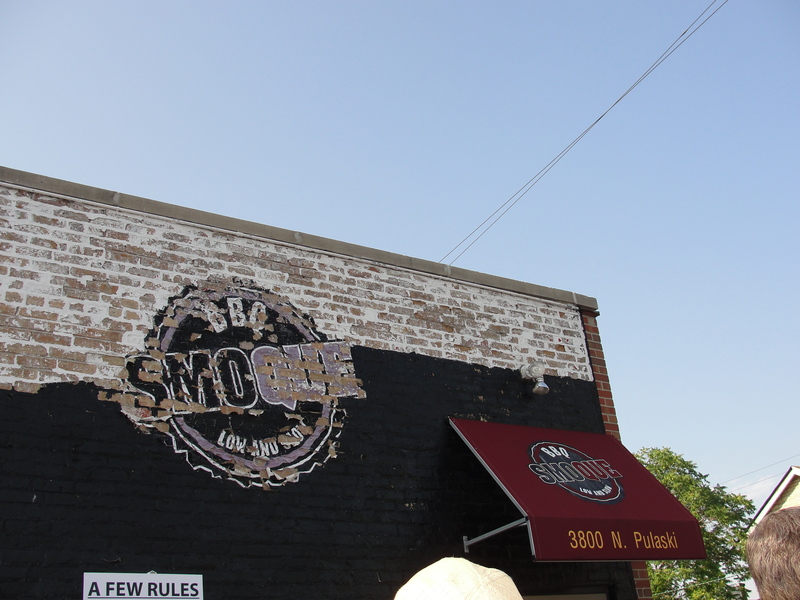 If you are in Chicago, make a trip to Smoque…just not on Monday’s because they are closed. And even if the line is out the door, wait around – you will not regret it. And I promise you will say in your best voice, It’s SMOKY!! !